Woot! Children's Week is here. I've been waiting for it for the past month. And in true NOOB fashion, I ran directly to Stormwind and did the entire questline only to find myself with the choice of the pig, rat, and turtle again. WTF? Meanwhile, the rest of the people in my guild started the correct quest line in Lower City. You take the little Orpan to the Dark Portal, Auchenei Crypts, Aeris Landing, Caverns of Time, and Exodar. 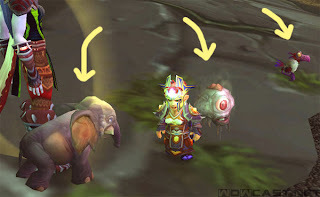 Then you get the baby Elekk, baby Hawkstrider (bird in an egg), OR baby Mike Wazowski (Willy). You know, the cute one-eyed monster in Disney's Monster's Inc. I'm almost done. Just need to port to Exodar and somehow get back to Shat.. The hard part? Picking which one! !